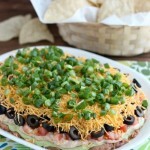 Skinny Seven Layer Dip - Dessert Now, Dinner Later! *This post is brought to you by Harvest Stone®. Thanks for supporting the brands that make Dessert Now Dinner Later possible. 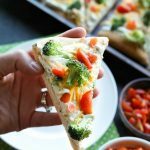 This Skinny Seven Layer Dip is loaded with fresh veggies, and makes a great appetizer or snack for any party or barbecue! I saw a meme in my instagram feed about a month ago that said, “When you realize summer is right around the corner…” and the picture is a Google search bar that says, “How to lose 30 pounds in 1 second.” Haha! That’s totally how I feel, but it’s okay. 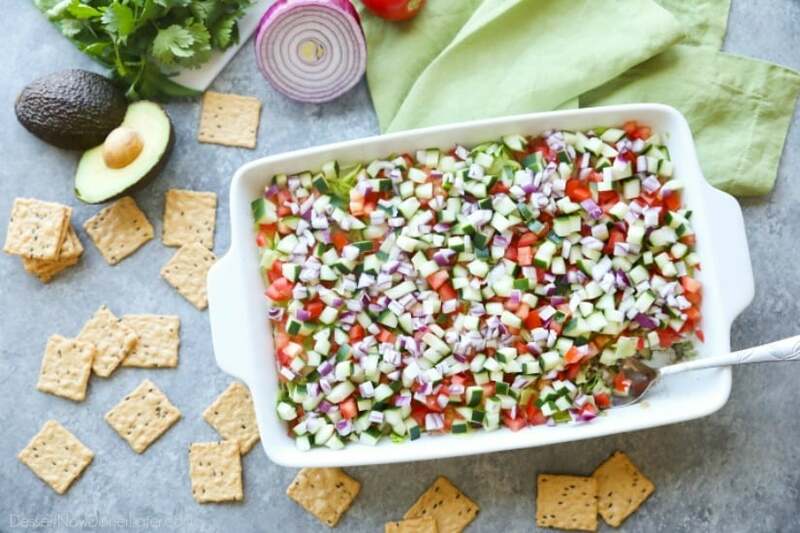 I’m all about moderation, or modifying recipes, and today’s recipe takes classic seven layer dip, and turns it into skinny seven layer dip with a few simple swaps. 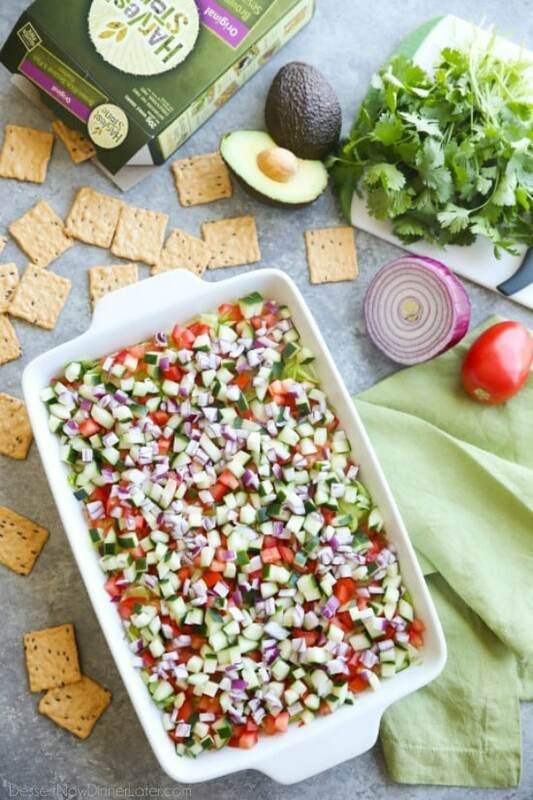 This skinny seven layer dip starts with the usual – a bean layer (I did black beans instead of refried beans) and an avocado/guacamole layer. 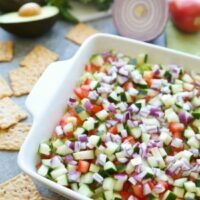 The next few layers are where the most modifications come in to make this seven layer dip better for you. I did non-fat Greek yogurt instead of sour cream, shredded lettuce instead of shredded cheese, and then I piled on the veggies — tomatoes, cucumbers, and onion. 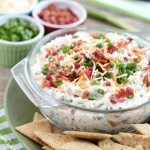 The results are a fresh, crunchy, flavorful, and satisfying party dip! 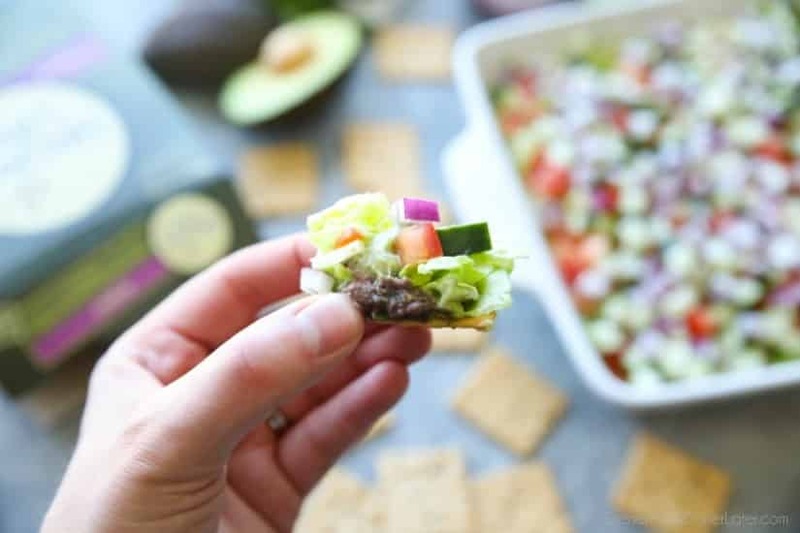 Now you don’t want to ruin a wholesome dip like this with tortilla chips, so I served it with Harvest Stone® crackers because they are USDA organic, certified gluten-free and non-GMO. The Original Brown Rice, Sesame & Flax Crackers (pictured) are great, but there are lots of flavors to choose from that would be equally as delicious. They are crisp, with the right amount of saltiness, and I love that they are better for you. So with the fourth of July and barbecue season upon us, don’t sacrifice your healthy lifestyle. 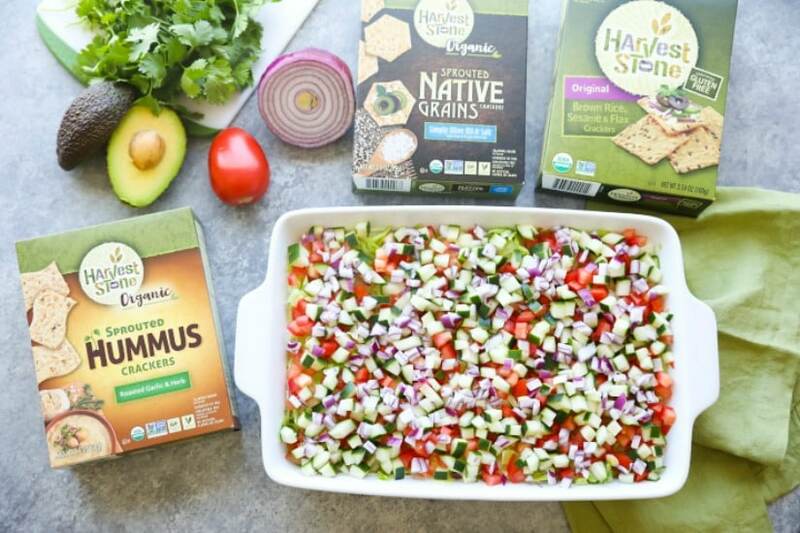 Bring this dip and Harvest Stone® crackers to the party! Then you’re sure to have something nutritious to eat. I’m betting your friends will even like it too! 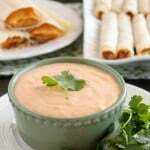 In a food processor or blender, pulse all ingredients until mixed, but still chunky. Spread the beans in an even layer on the bottom of a 9x13-inch baking dish. Spread the avocado in an even layer on top of the beans. Spread the Greek yogurt in an even layer on top of the avocado. 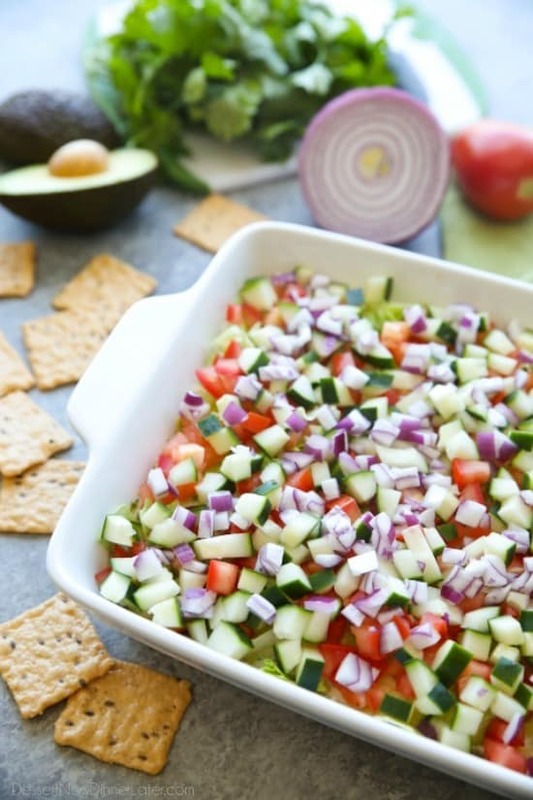 Sprinkle with lettuce, tomatoes, cucumber, and red onion in the respective order. Serve immediately with Harvest Stone Crackers. Cover and refrigerate any leftovers.